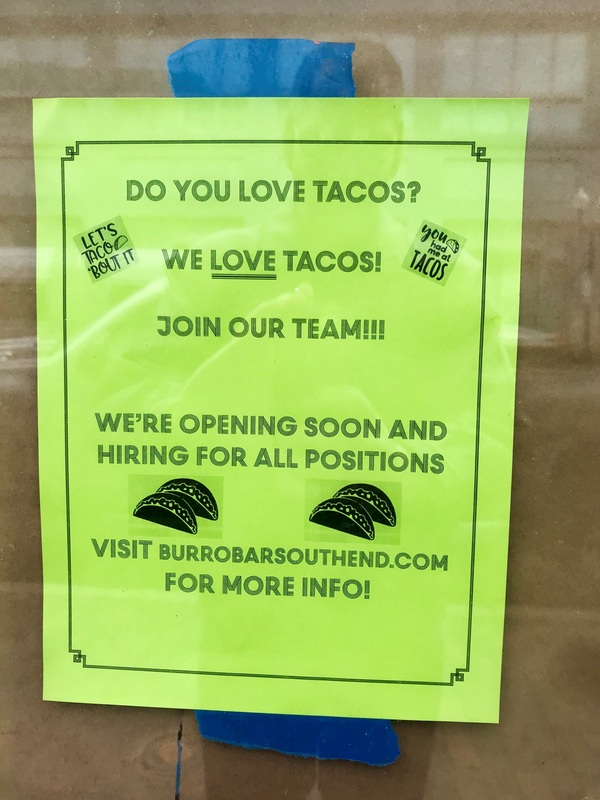 The Burro Bar, which is opening a new location in space formerly occupied by the Aquitaine Group’s La Motta Ristorante, has posted notices on its windows along Washington Street, indicating that they are now hiring for: Manager, Sous Chef, Line Cooks, Dishwashers, Hosts, Backservers, Barbacks, Servers and Bartenders in their soon to open South End location. The Burro Bar South End website describes itself as a neighborhood Mexican kitchen and tequila bar and the newest sibling of The Painted Burro in Somerville and Burro Bar Brookline. Chef Joe Cassinelli’s menu will be a welcome addition to the South End which has very few Mexican options. No word on when the restaurant may open but work continues at a brisk pace. This entry was posted in Dining and tagged BosGuy, Boston Guy, Dining. Bookmark the permalink. There are several positions I’d like to apply for. I might even be able to suggest a few new ones!